Store in a cool and dry place. Keep away from direct heat / sunlight. Ingredients: Wheat Flour (70%), Palm Oil, Salt, Colour (Beta Carotene (E160a), Stabiliser (E452). 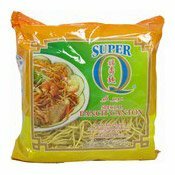 Simply enter your details below and we will send you an e-mail when “Fried Chop Suey Wheat Noodles (Pancit Canton) (菲律賓福壽麵)” is back in stock!